Some see the world in black and white. Either something is or it isn’t. Right or wrong. Funny or serious. Sweet or bitter. Good or evil. Pairs of opposites balancing the world…. In truth things are rarely so simplistic. The lines between opposites blur and blend in the most unexpected ways, weaving souls into wonderfully complex and unique tapestries, no two identical. What is true for humans is also true for the spirits of their nations. 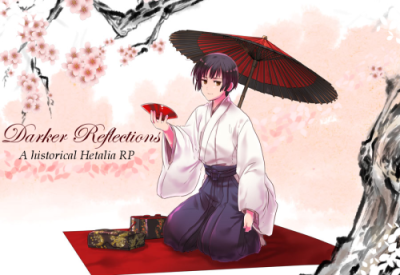 Darker Reflections is an advanced-literate Hetalia roleplay that isn’t afraid to delve into more mature themes, concepts, and situations in addition to the usual light-hearted stuff. Serious, comedic, light, dark, joyous, sad, scary, relaxed, heedless, thoughtful, and everything in-between, you’ll find it on our palette. We are historically based and have a WWII theme going on, although plots and threads from all time periods are welcome. When the ugly side of history is brought out into the open along with the glamorous and morality is subjective, all nations cast slightly .